University of California Press and Gastronomica: The Journal of Food and Culture are pleased to announce the all-new Gastronomica Website! With free articles, Web-exclusive content, and an expanded Chef’s Page—featuring interviews with notable chefs from around the world—never before have you seen so much great writing on food, all in one place. 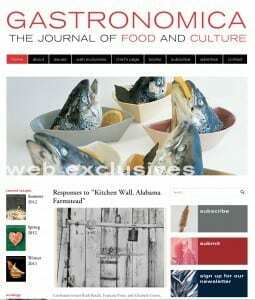 So visit today, and come back often as we continue to add new content to the all-new Gastronomica.org!